Both Shatrughan and Yashwant, have been critical of the central government and have often seen sharing stage with leaders and parties opposing the BJP. 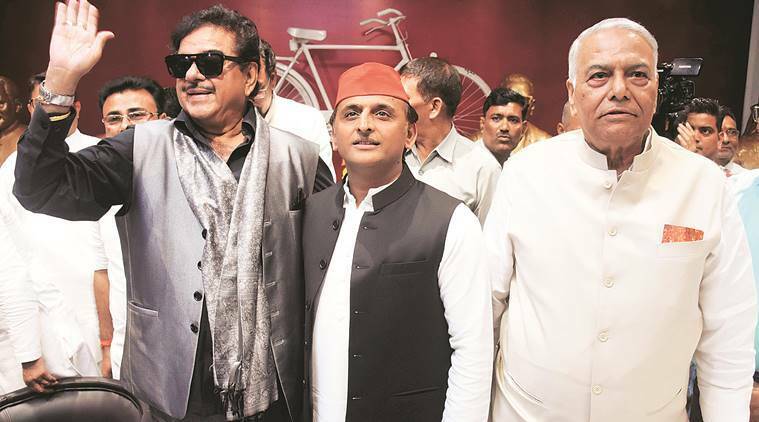 BJP MP Shatrughan Sinha and former BJP union minister Yashwant Sinha on Thursday shared the dais with Samajwadi Party (SP) chief Akhilesh Yadav on the birth anniversary of socialist leader Jai Prakash Narayan (JP) in the SP head office in Lucknow. On the occasion, they heaped praise on Akhilesh while terming the situation in the country as worse than the time of Emergency. Both Shatrughan and Yashwant, have been critical of the central government and have often seen sharing stage with leaders and parties opposing the BJP. Although he did not refer to the recent income tax department raids on The Quint, Yashwant said, “Those who do not follow the government line have to face income tax raids.” Yashwant Sinha also said that ministers had no clue about what was happening in their own ministries. Maintaining that he is not against the party but against the individual, Shatrughan Sinha said that if speaking the truth out is considered revolt then he has done one. Akhilesh returned the favour to Yashwant and Shatrughan. He said that while Jai Prakash Narayan had given slogan of “Sampurna Kranti” then, today the call was being given by Yashwant and Shatrughan. “There will be a wipeout (of the BJP) from Uttar Pradesh as well as Bihar. The next anniversary of JP will be marked from from the JP Centre in Lucknow,” he said.